Someday, I may be able to look back on today and remember the intense roller coaster that this morning has already been. But for now, I will take a few quiet moments on the occasion of Mother’s Day to write a short but rare blog post (yes! an actual blog post!) in honor of my beautiful mother. In the 13+ years that I have been blogging, I have made reference to my Mom and even posted funny stories about her, but I have never written a tribute to her, nor have I posted a photo where you could clearly see her face. Not only am I protective of her privacy, I also think it’s overwhelming to me to honor my Mom in writing because simply I don’t have the words to express how grateful I am of her sacrifices and how much I love her. When my Dad passed away in 2006, so many people commented on how much like my father I am. But in all honesty, I have always been a perfect blend of the best of my two parents. If I’m anything like my father, it’s because he and I shared the same kind of mind– full of curiosity and unending desire to read and learn. If I’m anything like my mother, it’s because she and I share the same loving spirit and compassion for the world around us– we care and love deeply, and are concerned for those around us more than we are for ourselves. Many times, when I know that I have given too much, I think that this is my biggest flaw. Deep down, however, I know this is actually one of my biggest strengths. My Dad didn’t always communicate his emotions in words, so there were times when I felt like I didn’t know what he was feeling. But I always felt like knew what my Mom was feeling because I didn’t need words to know– I just had to listen to my own heart, because our hearts are so alike. If my father shaped my head, then my mother shaped my heart. If you have ever known my warmth, my enthusiasm, indeed, my love… then you have known my mother… because all these essential parts of my spirit are just a fraction of what I received from her. Thank you for everything, Mom! I love you! I don’t know the context of the photo above, but this picture of my parents was taken about two years before I was born. If I were to guess where this was taken, it would be Syracuse, New York, around the time that my Dad would have finished grad school and started working for his professor’s architectural firm. 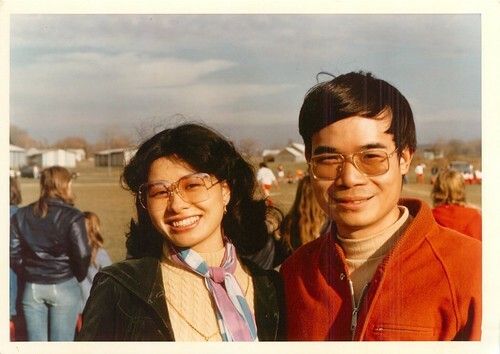 Mom joined Dad in Syracuse after she finished studying public health at a medical school in Japan, but was so miserable because of the brutal winters there that they soon moved to sunny Southern California and never looked back.